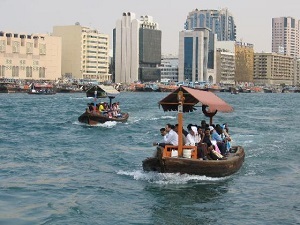 Usually people used to explore Dubai by land tours and sightseeing trips, while with this trip you will get a unique opportunity to explore the city by a sailing boat which will sail along the Dubai creek previewing the city highlights and accompanied with voice commentary comprehensive presentation to Dubai history and foundation of UAE country. Tour also provides unique photography opportunities on different spots. � 1 Hr Cruising, with prerecorded English commentary.